Which is the best binary options software to invest in? This is one question many newbies in binary options trading always have. This is because the available systems in this industry are in their hundreds and many more are entering the market every week. Traders already in the industry too want to find out the best software that can improve their trading especially if they are receiving less than satisfactory services from their current software. It is for this reason that both new and experienced traders would want to know a lot more on the newer software in the market. One of them is the Cash Camp system. This is a fairly new system to come into the market. As such, there is not much that is known about it. It is also quite difficult to find information online. If you do, you will need to search deeply as it looks like optimizing their site is not a priority. Getting to their website, you will find a sales video, much like the ones you will see in all of the software being launched these days. This is where you will find most of the information on the Cash Camp system, what they are all about, and what you stand to gain when you sign in. 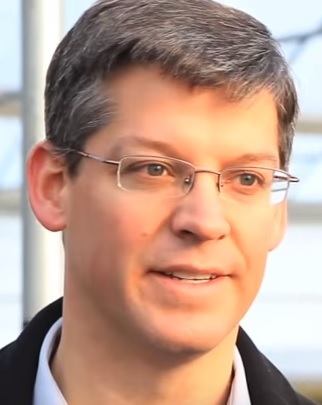 One Michael Solovsky is introduced as the creator of the Cash Camp software. He is also the platform’s CEO. He will tell you in a smooth TV anchor like voice how great the system is and how much it is going to benefit you financially as there is nothing like it in the binary options today. One thing you will notice is that the video is of high quality. You will also notice that they really emphasize that they are not the kind of software that promises to make you a millionaire in weeks or a couple of months. 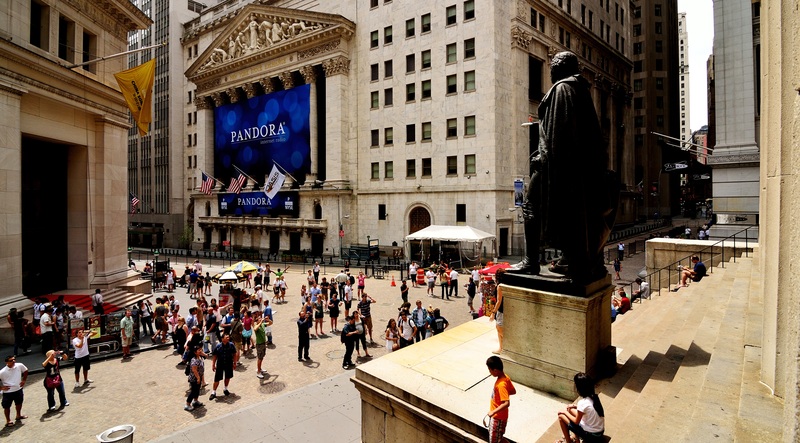 They want to come off as one platform that gives assurances of earnings and expectations as something that they can meet. What they do assure you is that with their system, and with a small minimum deposit, within a few days you will be earning about $1,000 every day on the lower side. With a higher deposit, your earnings will increase proportionally. Despite the system being fairly new, they claim that they have in their stable over 50,000 traders who are enjoying the benefits of the Cash Camp every day, and this is where you should be too if you want to make the kind of money that those thousands are making today. The sales video also has the ubiquitous traders giving impressive testimonials about Cash Camp has changed their lives and elevated their quality of life to heights that were unimaginable before they signed up with the Cash camp system. You are also shown screenshots of various traders and their earnings. What do you stand to benefit from this system? Everyday, you will be provided with a minimum of 120 signals. These are what your account will use to make you the amounts that they have promised. With an accuracy of 97.3% you will note that the chances of losing your money are negligible with Cash Camp. Cash camp uses Auto Trader. This implies that the system is fully automated. As a trader, the effort and time that you will invest here is very little. This is because the system will generate its own signals and then execute the trades on autopilot. What you will do is set the amount you want to be the maximum stake for each individual trade. After you do this, the system does the rest; it will place the right predictions according to the signals and automatically decide the expiry time each trade will have. Once in a while, you canlook at your account and see it growing as profits come pouring in. To make your experience more interesting is that there is a competition that you will be eligible for the moment you sign in. A cash prize of $10,000 is up for grabs within 10 days of joining if you hit the ground running and emerge as one of the top traders within this time. Cash camp system promises enhanced client support systems for all their traders. They say that their support will be a 24/7 undertaking every day of the year. This way, you will not be stuck somewhere without support as help will only be one call, email or one click in their live chat support interface. Cash Camp offers training for new traders. This is intended to make their entry to the binary options world smoother than it would be if they did not have this kind of training. There is a live interaction feature in the Members Area when you open your account with the program’s broker. 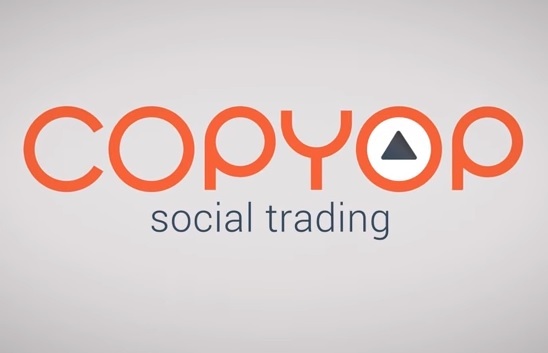 Here, you will interact with other traders and share experiences. This is where you will learn all the tricks of the trade and how to make Cash Camp benefit you better. The CEO says the software was developed with the traders as the primary focus. As such, the trading interface is easy to navigate. It is well arranged and you will never be more than a click away from what you want from the system. Getting to be a trader with Cash Camp is quite easy. You will fill in the information needed after you watch the video and then then you go on to open an account with the broker that the system will recommend. This is where you will make your deposit. The minimum amount here is $250 though you are free to up this amount to your liking. Apart from the trading deposit that will be credited to your account, the system is absolutely free to join and to trade with. You will not be asked to pay for the software of for any future upgrades. Should you make the Cash Camp system your trading platform? This system is overly persuasive to beginners to sign in. There is very little in the video or any other additional information about Cash Camp that makes experienced traders welcome. As an experienced trader, you might want to avoid this system as it seems there is not much for you here. A success rate of 97.3 is quite impressive if not too ambitious. This kind of success rate is near-perfect; the truth is that binary options trading is anythingbut. This is simply a marketing ruse to lasso you in and to make you want to start trading immediately. The competition for new traders joining in does not inspire much confidence. This is because it seems to be targeting new traders who are being encouraged to be the top traders in order to win the $10,000 cash price. 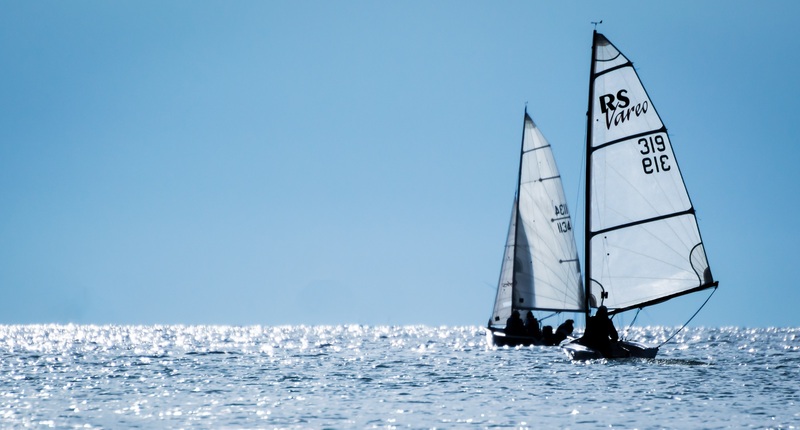 The downside of this competition is that when a newbie concentrates on the prize and neglects the steps he should take to be a better trader, he may lose the initial deposit before he makes any meaningful profit. The assurance that a trader needs to have that the system has his back in terms of customer support is quite wanting. The responses are not as prompt as they should be. What will you do if you wanted a quick response to an urgent matter and the support turns out to be slow? Why does the system recommend its own broker to register your account? You should be allowed to come into the system with your own broker if you already have one with whom you have a good working relationship. 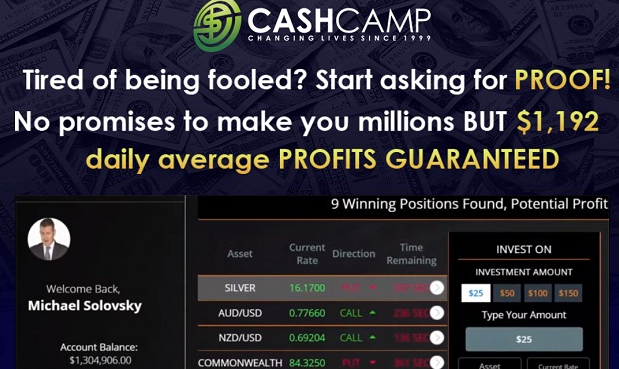 Cash Camp is very new and it is unlikely to have retained the 50,000 plus traders who are already making thousands of dollars each every day. It is rare for a platform that has been trading for a year to have that number of traders and it seems Cash Camp is stretching the truth a bit here. Cash Camp seems like it might develop to be a good system in some time to come, but they need time to grow and clear all the discrepancies that are being brought out about the system. 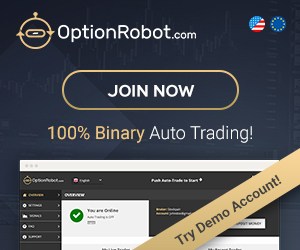 As a trader who wants to get things moving as soon as possible, you are well advised to open your trading account with Binary Option Robot, a consistently profitable program which meets all the promises it makes. 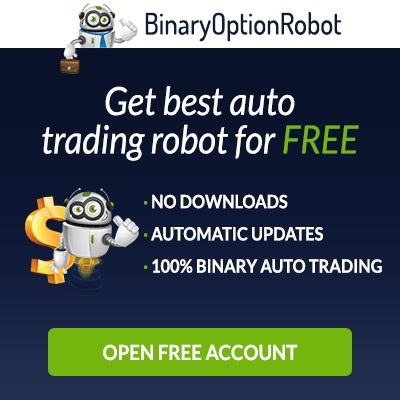 With this system, you will not deal with shady brokers as Binary Option Robot only retains the services of respected brokers only.